For all his public success, Steve Jobs was good about keeping his private life just that. From his family to his health concerns, few were let into Jobs inner circle but one man who was given that privilege long before others longed to be there was Steve Wozniak. Thursday the man who co-founded Apple with Jobs went on the "Today Show" and spoke about losing Jobs and what he was like before he became the tech icon whose loss is being mourned across the world today. "It's very difficult for me," Wozniak said. "We knew he was in poor health. It's kind of like when my father died and knew it was coming and told us. So when you expect it I don't go into a lot of crying that day. Ahh but just woke up with so many of those memories of what we used to do together." The two men met while Jobs was still in high school. 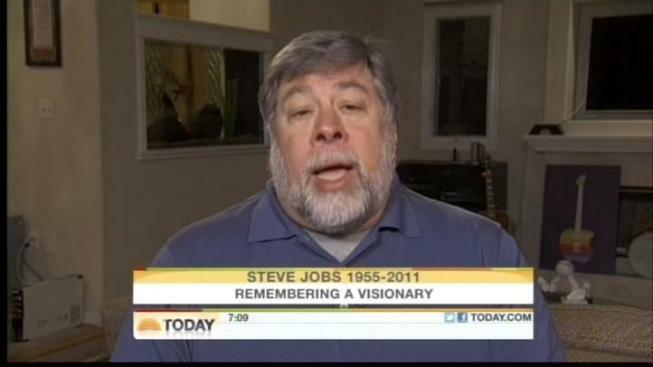 Wozniak said even at the time it was clear to see that Jobs wanted to be great. He said Jobs used to read a lot of books by great thinkers, such as Isaac Newton and William Shakespeare, when the two first met. Wozniak described his friendship with Jobs as "the perfect marriage" because of Jobs charisma and Wozniak's shy demeanor. Even in Apple's early days, Jobs would always come up with ideas that were better than everyone else's ideas. Wozniak said Jobs wanted to change the world from day one and he was the one that wanted to develop the company. The former "Dancing With the Stars" contestant also dispelled reports that Jobs was a difficult person to work with. He said when he was younger, Jobs did not display tough management tactics. The two men last met about three months ago and Wozniak said it was clear that Jobs was seriously ill. But he was still surprised when he heard of Jobs' passing. "I just felt dumbstruck," he said. "I almost couldn't talk at first." But Wozniak said Jobs would find some joy in knowing that much of the world found out about his death on a device he helped create. "As a businessman he didn't smile as much as when we were young but I think that one would tickle his fancy," he said.